We wanted to answer this right away, but security is so important that we didn’t want to announce anything until it was solid. Our requirements were clear: keep all of the parts that people love about Firebase -- real-time updates, easy development, scaling -- while adding enterprise-grade security. We've tested multiple approaches (with our awesome beta testers) and written a lot of code, and we're finally ready to show you our Security API. We’re excited to say that not only have we met our requirements, but we believe we've built the most flexible security model of any cloud data service. Building real-time apps is hard and scaling them is even harder. 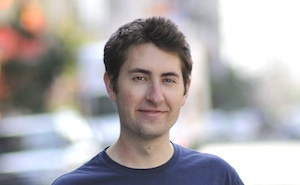 Firebase takes care of these complexities for you and lets you focus on building your app. 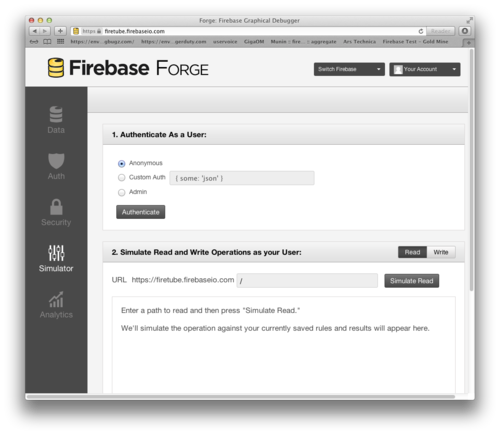 Our new security model lets you build secure apps where clients talk directly to Firebase. This means that for many apps, you don’t need to write any server code, and it even makes running your own servers optional. Security and Firebase Rules tell Firebase which operations are permitted for a specific user. You upload these rules to Firebase when you deploy your app, and we enforce them consistently whenever data is accessed. The rules are where the new API shines. Rules come in three flavors: read and write rules allow or deny operations when reading or writing, and validate rules enforce a specific schema on your data. ".validate": "newData.isNumber() && newData.val() >= 0"
The Firebase rules language is designed for performance and scale; its expression-based rules provides fast, predictable execution times and allow Firebase to optimize and cache the results of those expressions. An important benefit of the Firebase security model is that it places all of your security logic in one place rather than sprinkling it around your code. Firebase then ensures that your logic is enforced consistently across all parts of your app, regardless of how data is accessed. This makes it very easy to reason about your app's security or do formal security audits. The rules also allow for static analysis, so mistakes can be caught immediately when new rules are uploaded. For more rules details, see our documentation. (The list is actually much longer, but hopefully you get the idea). Our goal is to take care of all of the complex but mundane details of securing your app so that you can focus on your application logic and your customers (rather than, say, reading about the latest hash function vulnerabilities). firebase.github.io - We'll put code snippets, full examples, and libraries here that you're free to fork, modify, and use in your apps. We'll continue adding more content over time, so keep checking back. Security Simulator - Our security simulator lets you test our Security and Firebase Rules while building your app. It lets you simulate various authentication methods and data operations, and it provides helpful feedback to help you track down potential problems. You can find the simulator by going to the URL of your Firebase database. We're really excited to show you our security features. The whole team has put an incredible amount of work into making them easy-to-understand and easy-to- use, qualities we strive for in everything we release. We hope you will use these new features and give feedback to help us improve. If you don't have a beta code yet, you can request one here. Also look out for our public beta launch soon. Login to see the new graphical debugger, Forge. 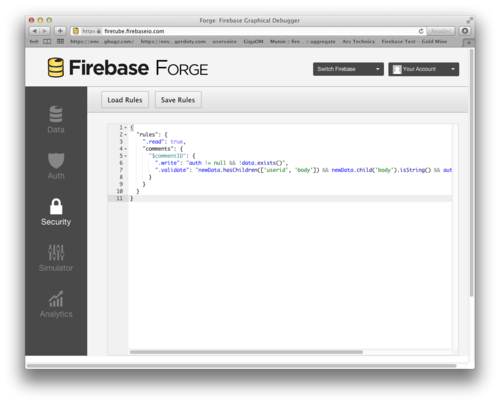 If you’re new to Firebase, try our 5 minute tutorial. Now go and build something awesome! 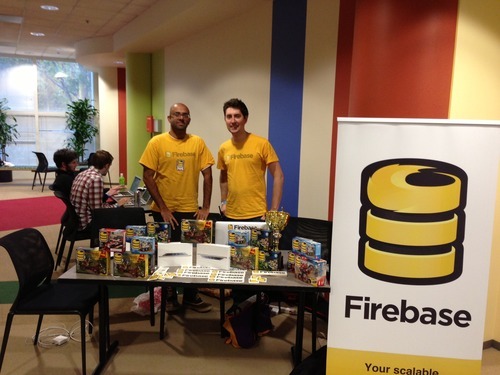 The entire Firebase team was at AngelHack (silicon valley edition), hosted at the PayPal headquarters (a wonderful venue) in San Jose last weekend, and we had a blast! The event was well attended - we had printed over 400 beta invites and ran out in only an hour (we emailed codes to those who needed them later through the day). The morning of the first day was mostly used to let people recruit participants, organize teams and their ideas. We also had presentations by each of the sponsors (including Firebase), highlighting what they offered and how they could help everyone build their hacks. We setup our (nice looking, I might add) booth and had some of the crew head out and offer help to all the teams, who were just getting started with some early ideas and designs. Later in the evening, we conducted a breakout session to answer questions and help everyone who had decided to use Firebase for their hack. Andrew Lee, our co-founder, stayed at the venue overnight to continue helping! 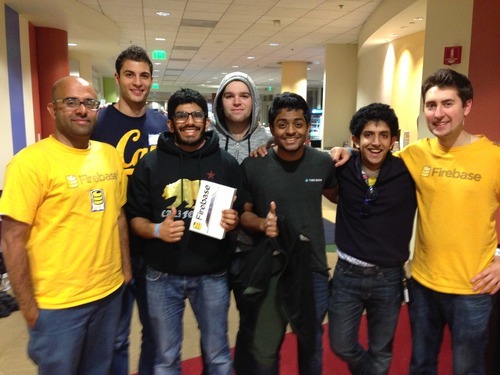 There were 85 hacks submitted to hackathon.io (a platform for organizing great hackathons, powered by Firebase!) at the end of the 2-day event. 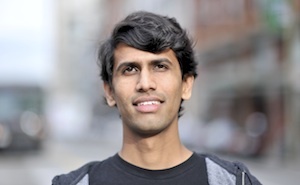 After all the teams got a chance to present, 4 were picked as finalists to go on to the next round, including Rohan Pai who built an amazing tool called FireMap that uses Firebase to generate real-time heatmaps for any website so you can observe your user's behavior. Congratulations Rohan! 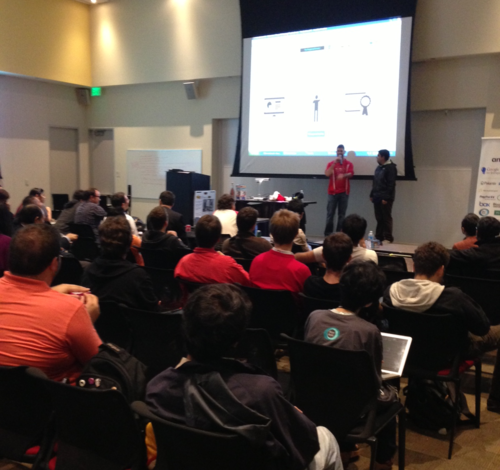 Of the 85 submissions, 57 teams used one or more APIs to help build their hack. We're very proud that 25 teams ended up using Firebase to power some aspect of their hack, making us the #1 API used at the hackathon! As a token of our appreciation, every team that used Firebase received a fun lego set, and the top two teams both got an iPad mini each. The first iPad went to the Reboxed team (along with a glamorous trophy), who built a very useful hack that lets you re-purpose your old phone to act as a sensor, so that you can, for example, attach a smoke detector and setup an alert that will send you an SMS or an email. The second iPad went to the LevelUp team, who made a great a fitness app that acts as your personal trainer, suggesting exercises and motivating you to do more of them! 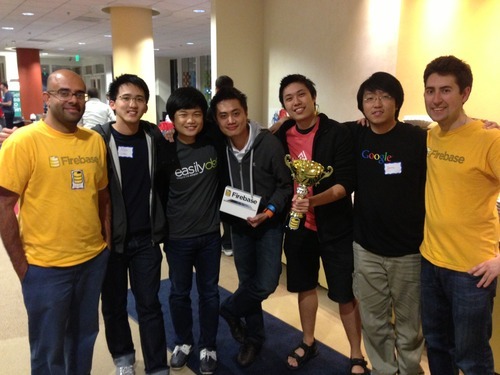 Filepicker.io, KeenIO, and Singly were some of the other popular APIs being used by the hackathon participants. API providers are certainly gaining wider adoption amongst the developer community, especially at a hackathon, where using something like Firebase lets you focus on what's really important - your product - instead of having to worry about the not-so-easy task of building a back-end to power it. We had a great time, and are already looking forward to our next event!